Near Caen, June 1944 the British now realise the danger they’re in. Attacked on both flanks, the Scottish Corridor is in real danger of being squeezed shut but simultaneous German counter-attacks. 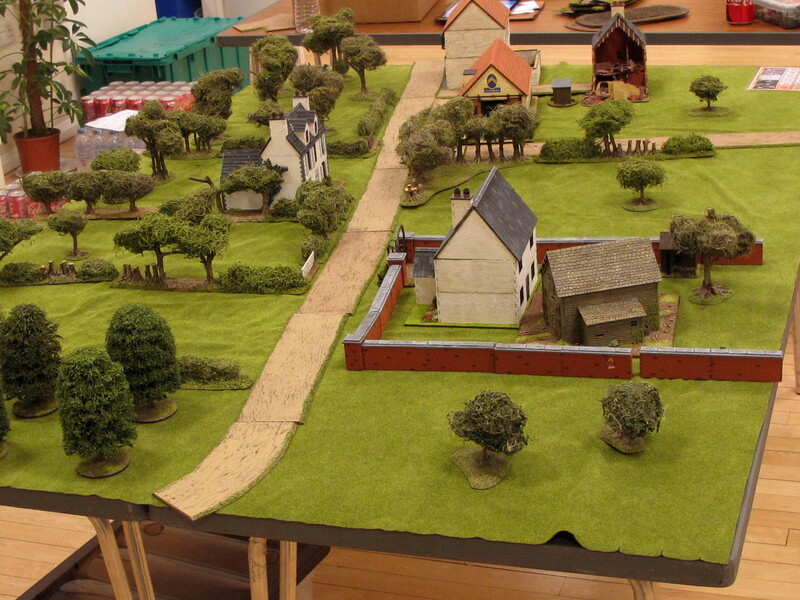 Kampfgruppe Weidinger had unveiled this nasty surprise in the last game when they sent the Scots packing at Le Valtru, and now on the other flank Kampfgruppe Frey hopes to repeat its earlier success in Mouen. The action switches back to Kampgruppe Frey now, looking to continue their drive. The ground is divided up into multiple small fields with hedges and farm buildings with walls. A road runs through the centre, and the Germans will be keen to push down it and pinch off the Scottish salient. The Germans rolled low for free patrol markers moves, only two. 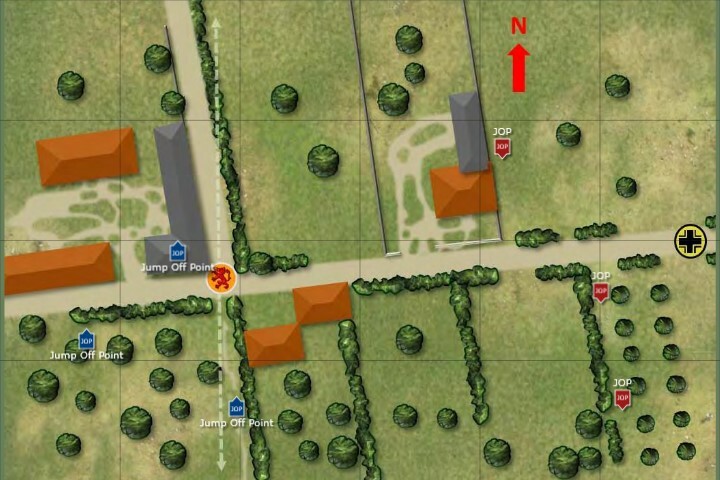 The two lines met at about the expected point, and the British were able to keep the German JOPs fairly constrained, with two of them forced into the woods near their table edge, while another got up into some houses on the German right. The British went for a JOP either side of the road, deployed fairly deep in their own defensive zone, with their third linking the two positions. Without enough support to field much of an anti-tank defence my plan was to rely on close terrain and smoke from 2″ mortars to mitigate the effect of any German armour. My plan was to focus on tangling with the infantry. With their 16pts of support there was a pretty good chance of the Germans at least bringing an extra squad full of LMGs, so I felt I really had to bring one of my own. I’d still be outgunned, but maybe not so badly and a pair of 2″ mortars really can throw some serious smoke around. My thoughts this time around were to hang back in the dense terrain and let the Germans deploy. Deploying forward when you’re facing superior firepower is not a great idea. I’d really have liked an extra couple of points to dig some lads in, but I planned a fairly mobile defence, and any immobile dug in troops were likely to just attract an 88 on a big tracked chassis. The Germans were playing a similar game, bringing plenty of infantry firepower, with a whopping five squads and an infantry gun. This would allow them to dominate any firefight that blew up in the close terrain. Straight up, this was a very strange game. That started right at the beginning, when the Germans declined to deploy any attacking troops. It’s pretty normal for a defender to wait before deploying, but I’d never seen it from an attacker before. So we both sat there alternately rolling and rolling our command dice over and over, and racking up Chain of Command points. I was a little worried that this left the British at a big disadvantage, as the Germans accrue them at a much faster rate due to their special rule in this campaign. Sure enough, there was soon a little pile of full CoC dice sitting on the German side. It turns out that there was a bit of a misunderstanding about the terrain, and Phil thought that from where he was deploying he would need a double phase to avoid being caught in the open crossing the field immediately to his front. My Jump Off Points were miles away though, so he was always going to get at least light cover from all the intervening terrain. Eventually he managed to roll his double phase, so we began. The Germans sent forward first one, then a second squad, and the first began to move across the field. After all that waiting Phil rolled to see how far his men would dash across the field…triple 1! Still, they were safe as houses, as I had no intention of getting into a long-range firefight against the superior German firepower. This is the German pile of five CoC dice that they STARTED the game with! The two German squads took it in turns to leapfrog up from one hedge to the next, and soon they were approaching the field nearest the first British JOP. The British spent one of their several CoC dice to catch a German squad crossing a field with a blast from a Bren gun, and some dangerous shooting saw two Germans fall wounded. The Bren melted away, but the Germans kept advancing and were soon in the hedge across from the British position. Now the defenders decided to show their hand, with the British platoon commander leading from the front and ordering a rifle section and the 2″ mortar to open fire. A handy double phase let them be refinforced by a second rifle section, and for a moment it looked like the British had enough firepower and smoke on the spot to give the Germans a good run for their money. Alas, the dice gods decided to intervene, and the Germans crucially rolled a punishing streak of double phases, during which the German squads in contact poured fire onto the British position. Back near their JOP an le.IG18 infantry gun also opened up, lobbing powerful HE shells into the British position. There was a ton of firepower going into the British position and it pretty much all found the mark, with almost every burst of fire scoring kills on the British and before long they’d ceased to exist as a viable force. The first rifle section was now reduced to three men, broke and fled, as did the 2″ mortar, which had only managed to get one shot off (which had missed). This left a single British Bren gun, which hadn’t even managed to get it’s rifle team into position yet as it hadn’t activated since deploying. This string of lucky command dice had been bad for the British, and was made worse by the very strange start of the game, which meant the Germans had crazy amounts of CoC dice available. After getting several phases of shooting, whenever the British activated they were able to simply play an interrupt and get another blat in. The British situation had rapidly gone from looking ok to absolutely shambolic. Looking at my options I seriously considered withdrawing, but I still had a force morale of six and a couple of CoC dice in hand (which effectively counts as a few more points of morale) and there were fresh troops available so I decided to stay and play. So far German casualties had been very light and they had a decent morale advantage which would mean the net effect of the game on German forces would be zilch. I had no chance of winning, but had to at least cause some casualties before pulling out. Clearly, this wasn’t going to happen in the current firefight though, the Germans just had the upper hand too much. I couldn’t stand against the firepower of those German LMGs and the infantry gun, so the British officer shouted for everybody to pull back further into the woods to regroup. Most of the survivors managed to do so, except for the only Bren gun, which had a fair bit of shock and rolled badly. This left it in full view of the opposing Germans, and it was quickly shot to pieces in the next phase. All of a sudden, calm descended over the battlefield. The Germans had totally dominated the firefight, and in the woods nearby the battered remnants of the British platoon consisted of two pinned and understrength rifle teams, with one mortarman and three riflemen in “broken” status. There was still one British section off-table, but it would be facing four healthy German squads and one slightly banged up one, plus a heavy weapon. The focus on the British side became rallying as much shock as possible, and I spent an entire phase of activations doing this, and not a moment too soon, as the turn randomly ended soon after and teams that would have routed instead unpinned. 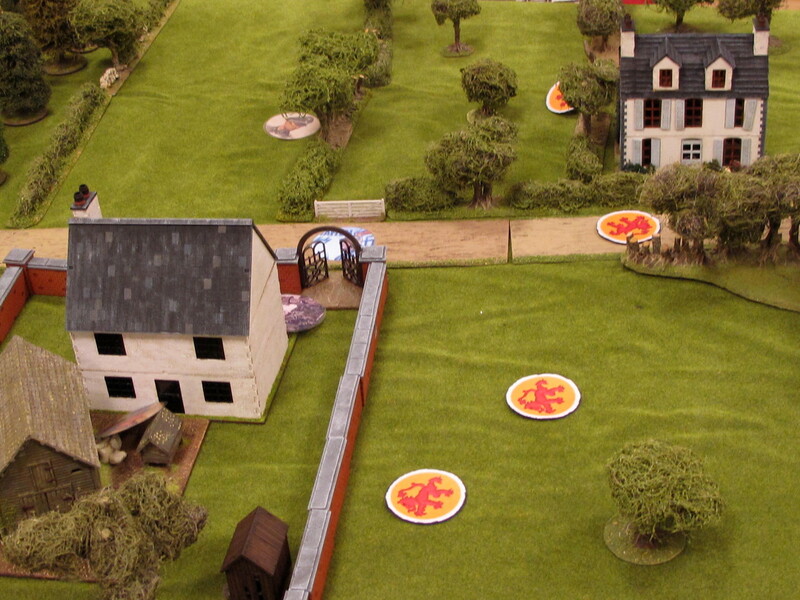 The Germans decided to press their advantage and a squad hopped the hedge to attack the British JOP. I spent a CoC dice to ambush them as they did, but only inflicted one point of shock. The target was too good to ignore though, so I sent in a fresh section to hit them, and did manage to chop down a few Germans. With an eye on the relative force morale and the casualties it looked like the British might actually be able to do some lasting damage before leaving. The German reply was strong though, with MG fire and 75mm HE shells pounding the fresh unit. They stood their ground though, as the last of the German troops in the open were finally cut down by one last effort of the British infantry. Now on his own, the German squad leader was hit, the loss of his men and his wound driving German morale down to six. But it was too little too late for the British, as German firepower quickly began to dominate this fight too, and in short order the British section lost it’s gun team and the JL was wounded, dropping British morale to three. The firepower of the rifle section was failing, and the newly-rallied 2″ mortar tried to help by lobbing a couple of rounds of HE at the wounded German JL lying in the open, but they just couldn’t finish him off. Luckiest man in the Wehrmacht, the bulletproof squad leader! It was over, another round of German shooting would break the last British section, so I threw in the towel and left the Germans the masters of the field. German morale finished on six to the British three, which cut their losses down to 2 dead, two wounded. In this campaign each German platoon really only has to fight a couple of times at the most, so they can definitely absorb these sort of losses. The British will be fielding a fresh platoon next game, but for the record their casualties were four dead, three wounded on the core platoon, with another four dead, two wounded from their rent-a-section. Getting the bad news out of the way first, the British CO continues to make sad faces, and his opinion now drops to -3, which means they already anemic British support budget will be squeezed by another point. The men were even less happy (and who can blame them?). They dropped three points of opinion, which puts them at -7 (-2 on force morale rolls) and earning the platoon commander an “interview without coffee” which somewhat bizarrely shifted the man’s opinion from “secure” to “happy”. There’s nowt as queer as folk, eh? Much more cheerful news on the German side though; the CO’s opinion goes up to four, meaning they’ll continue to enjoy +1 support. The men were pleased with the light casualties and their opinion goes up to 2, although this doesn’t confer any bonuses yet. The German platoon CO remains “content”. Not much to take away from this one, as the game wasn’t really decided by the tactical decisions of either side, but by the strange start (giving the Germans a very large pool of CoC dice) and then some very luckily-timed long strings of multiple German phases. There was no real maneuver in the game; the Germans advanced, the British deployed and got buried under an avalanche of dice, game over. I’ve always taken the view that multiple phases are rarely enough to totally dominate a game, and that when it does happen you’ve just got to take your lumps. However, I’m now starting to think that since it really does ruin the game when you’re on the wrong side of it it’s worth trying out one of the many house rules that people have suggested to fix the problem. We play wargames for the enjoyment and challenge, having your side trashed by the dice just isn’t any fun and is a waste of what could be a fun evening’s gaming. I don’t mind losing when it’s because I’ve played poorly or my opponent has played well, but sitting there watching impotently as all your choices and options get taken away from you by the command dice is just dull. I don’t really feel like I was able to influence anything about how this game played out, which does really leave you thinking: what’s the point? Once again Andy, great AAR, I can sympathies with you in regards to the multiple Phases, as you know I have been on both ends of the Dice gods and its no fun either side. Interesting game. I find that a useful counter to an enemy who refuses to deploy is to send a 2-man scout team forward to threaten his JOPs. Looking at the table, you may have been able to close down both of the German JOPs in the woods, forcing him to defend them early. Interesting idea Andrew. I was defending fairly deep though, so it was a bit of a trek up to his JOPs. I’ve never had a situation before where an attacker has refused to deploy! Great report, I understand your frustration with the multiple phases. Ha I agree 100% I have been convinced of this for a couple of years now – I am not saying stop the double turns completely but limit the run of them in some way. I am thinking of a variation on John Bonds method myself.